Jump In Studio » How Do I Get Published? Hey Shadra! Hope you are well. I wrote a book a few years ago and am interested in trying to get it published. Do you happen to have any contacts you could connect me with or your advice on attempting to publish? 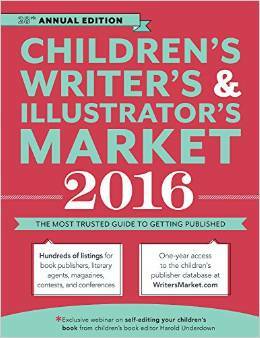 If you are interested in publishing books for children and are looking for contacts, the book that you need to get started is the Children’s Writers and Illustrators Market Book. This book lists most, if not all publishers of books for children. It is also full of testimonials and advice from published authors in the field. The children’s market is certainly not easy to crack. It takes thick skin, lots of patience, and perseverance to gain access to the field. Even after you publish your first book, you will have to work hard to see that book survive out in the world. With books having to compete with television, movies, and video games, an author should be prepared to do a lot of legwork to make sure their book stays in print. Some people have a manuscript that they wrote years ago and are only interested in submitting that one story. This is usually a dead end. In graduate school, I wrote and illustrated samples for two picturebook ideas. I submitted them both to publishers, got some good feedback, but wasn’t offered contracts for either. I revised them and put them away. In the meantime, I continued to work on my illustration and entertained many new ideas for picturebooks. As my illustration career grew and I gained more visibility, my agent continued to submit my picturebook manuscripts while I worked on my other projects. Somewhat recently, I was offered a contract for a manuscript I wrote in 2010. It is a fun story written on a whim—a story that I never knew was in me. I wrote it, shared it and put it away for years before revisiting it. Most writers will tell you, they have tons of stories in their files and a stack of rejection letters to match…especially in the early throws of their careers. They will also tell you that success is about 20% talent, 70% hard work, and 10% luck. Reading a ton of kidlit is also a great way to become a better kidlit writer. Read books out loud. Really listen to the way the story sounds. Pay attention to the way words and pictures work together. Stay up to date on the latest trends and successes in the field by reading industry reviews and articles. There are also a ton of resources on the web run by authors, illustrators, book lovers and book specialists like Seven Impossible Things Before Breakfast, A Fuse 8 Production, The Brown Bookshelf, etc. Hi Shadra, I recently wrote a picturebook and am in need of an illustrator. Are you available? If not, where should I look? Illustrating a book takes between 6 months to a year for most artists. Illustration advances typically start between $10,000 and $15,000 for new artists, but can run even higher. A writer is not expected to hire their own illustrator. When a publisher decides to publish your manuscript they search for illustrators for you. Some will decide to self-publish. In this case, yes you will want to look for your own illustrator. The Society of Children’s Book Writers and Illustrators (SCBWI) is a great resource for this. you may also want to look to your local art school or university for students who are looking to hone their skills and are willing to work with your budget. SCBWI is also a great place to find other authors and writer’s groups who can offer constructive feedback and helpful critique before you are ready to submit your manuscript to publishers and agents. If you are interested in becoming a children’s book illustrator, you will need to submit samples of your work to publishers in the form of postcards, tear sheets, or through e-mail submission. You will need to be persistent. Publishers are often super busy making books and may not have a ton of time to respond to your submission right away. Be patient. Continue making work and submit more samples between every three to four months. If you would like some guidance on how to make a picture book, check out my online class at Craftsy, The Art of The Picture Book. I share a few writing tips, but the class is mainly focused on how to go from idea to thumbnails to final art. I love your craftsy class. I’d never thought about cutting up my sketchbook pages & using a copy machine, it’s almost like an analog version of photoshop. Craftsy led me to your Youtube which led me to Jump In. Thanks for this post. I have 2 questions and a recommendation, what books/educational materials do you recommend for improving composition, what are some ways I can get better at drawing backgrounds (mine are too busy or too boring & the scale always seems wrong), and my suggestion–please make a Craftsy watercolor painting class. Your watercolors are gorgeous. I’ll check those books out immediately. I’m sad there’s not another Craftsy class in the works; I like the way you paint skin tones . As for Matt Rota’s class, I’ve been eyeing his mixed media class, and I’ll take a look at his watercolor class. Thank you!